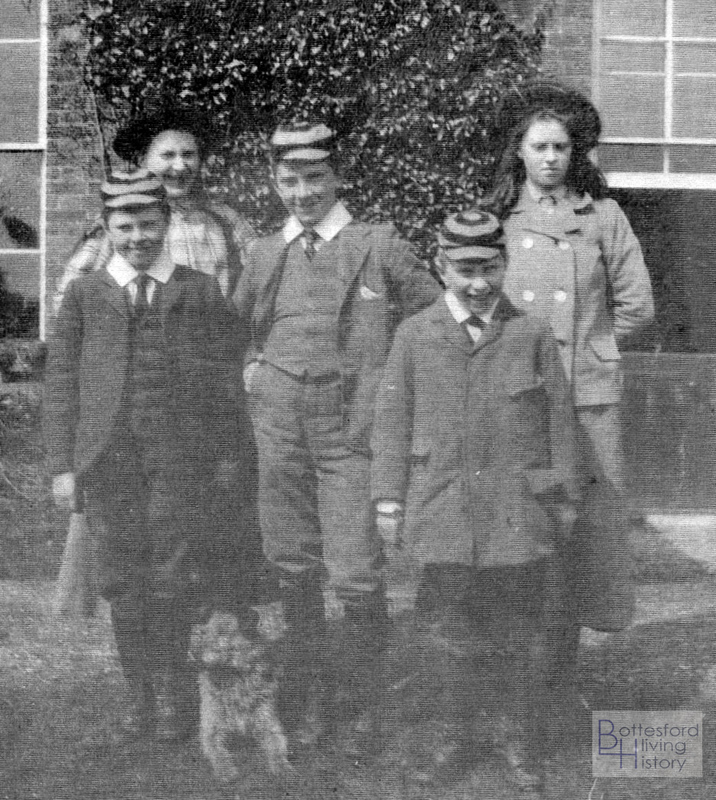 The Nugee children at Muston Rectory, c.1904. From L to R: George, Elizabeth, John, Andrew and Laura. The information in these brief biographies of the Nugee family has been assembled from the usual genealogical sources greatly augmented by family archive information generously made available by Mr Julian Walker, principally the private memoirs of the late Andrew Nugee, short extracts of which are quoted here where appropriate. We are greatly indebted to Mr Walker and hope this short account of Francis John Nugee, and those of the other two sons, George and Andrew, capture the spirit of service and sacrifice of this remarkable family. 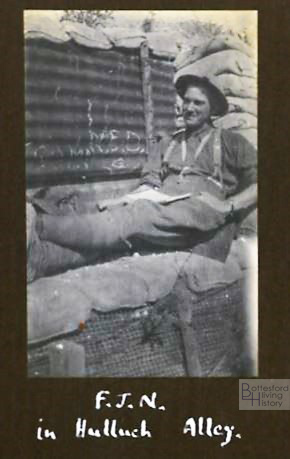 Francis John Nugee, known affectionately as John, is included among the servicemen from Muston because his family lived in Muston Rectory from 1903 to 1913. He was recorded as living at the Rectory in the census of 1911, and spent the summers and other holidays at the Rectory. He was born in 30th May, 1891, and baptised at St Stephens, Sneinton (Nottingham), the oldest son of Reverend Francis Edward Nugee and Edith Isabel Nugee (née Alston). Reverend Nugee was born at Wymering, Hampshire. He served as parish priest of a series of communities in the East Midlands, eventually becoming Dean of Framland and then going on to be a Canon of Leicester Cathedral. Thus, he was successively vicar of Sneinton, Shelton and Croxton Kerrial in the 1890s, then Rector of Muston (1903-1913) and Dean of Leicester Cathedral. In 1918, he left the cathedral and retired to the Rectory at Shangton, near Market Harborough, where he died in 1930. His wife Edith outlived him by many years, and died in 1958, at Eastbourne, aged about 98. There were five children: Elizabeth Catherine (born 1889), Laura Christine (b.1890), Francis John (b.10th November, 1891), George Travers (b. 1893) and Andrew Charles (b.1895). All three boys went on to serve in the army during WW1 and were fortunate enough to come through and live into old age. Andrew Nugee adds that, in addition, their sisters were also active in the war effort. Elizabeth remained in Leicester with her parents, doing all manner of war work in the town and eventually settling down to an organisation post in the county with the Women’s Land Army. She apparently never married, and died in 1991 in Berkshire, aged about 102. Laura married Regie Richards (later Lieutenant Reginald Philip Edwards Richards, Army Service Corps) in 1915, and went on to become a VAD at Nottingham General Hospital and then joined Queen Mary’s Army Auxiliary Corps. There is a Medal Index Card for Laura Richards, 32896 Worker, Queen Mary’s Army Auxiliary Corps. She died in 1970 at Battle, Sussex, aged about 81. In 1900, Francis John Nugee was sent to a preparatory school at Laleham on Thames, Middlesex, and went on to Radley College in 1904. Here he was in the 1st cricket and football XI, a cadet officer in the OTC and a diligent scholar. In the summer of 1909, he started his second year as Senior Prefect, the only one who has ever held that office for more than a year. School holidays were spent at Muston. John and Andrew followed their brother George’s riding footsteps, but not with his skill. John was remembered sitting astride his mount with a look on his face of mingled apprehension and dislike, and with a seat which looked as if it would become unstuck at the slightest provocation. George was also the expert in winter outdoor activities, but in the summer John excelled at cricket and tennis. John went up to Magdalen in the winter of 1910 to read History and planned, after getting his degree, to go to Cuddesden Theological College to prepare for ordination. In 1911, he started his university studies and in the summer of 1914 was awarded his degree, Honours in History. He had been due to spend a year as assistant secretary to the Bishop of London before going on to Cuddesden, and was not able to enlist immediately with his Oxford contemporaries. In 1914, his father was often unwell, and the family decided to take a holiday at Argentières, above Chamonix. Elizabeth and John went with their parents. Though war clouds were menacing, they did not leave England till the 26th July, reflecting the degree to which people still thought the outbreak of war was quite impossible. John had served in the Officer Training Corps at Oxford, and earlier in the Junior Division of the OTC at Radley College. After the war had started, he got his commission and joined the 1/4th Leicestershires, being promoted to 2nd-Lieutenant on October 5th, 1914. He was put in command of C-Company, 1/4th Leicestershires. He went on to be promoted to Captain (1st June, 1916) and Acting Major in the Leicestershires. The 1/4th was raised in August 1914 as part of the Lincoln and Leicester Brigade, North Midland Division. It moved to Luton and Bishop’s Stortford before entering France on the 3rd March, 1915, landing at Le Havre, becoming part of the 138th Brigade, 46th (North Midland) Division (along with 1/5th Leicestershires, the 1/4th and 1/5th Lincolnshires, and the 138th MGC and 138th Trench Mortar Battery – information from the Long Long Trail website). It was the first Territorial Force Division to arrive complete in a theatre of war. The 46th was posted to Ypres and took part in battles including Hooge (30-31 July 1915, remembered for the first use of ‘liquid fire’) and the attack on the Hollenzollern Redoubt (13 October 1915). In December, 1915, it was transferred to Egypt, but after arriving there the move was countermanded and it was brought back to France and Flanders, where it remained in action for the rest of the war. On the 1st July, 1916, it took part in the attack on Gommecourt, at the start of the Battle of the Somme. In 1917, it was in action including the German retreat to the Hindenburg Line, and in 1918 in battles including the St Quentin canal and the Hindenburg Line, and the final advance into Picardy. Finally, in July 1919, the 4th Battalion was at Le Cateau for the start of demobilisation. John Nugee left Southampton on the 12th July, 1915, to join the 1/4th. However, he received shrapnel wounds a short time later, before the Hollenzollern Redoubt attack (when most of the 1/4th was decimated), and was taken to the hospital at Le Treport, where by coincidence his brother Andrew had already been taken, severely wounded. John’s wounds were not so severe. He had two or three shell splinters in his back, not deep, and they were easily taken out. When that was done he was sent to England to complete his recovery. 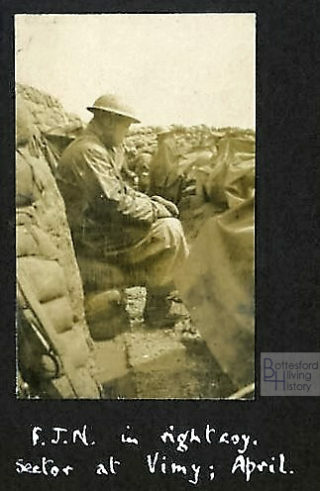 He was able to return after treatment and recovery to the battalion in Autumn, 1916, and served with it for two more years, in the line all the time, with many narrow escapes but without any further wounds. 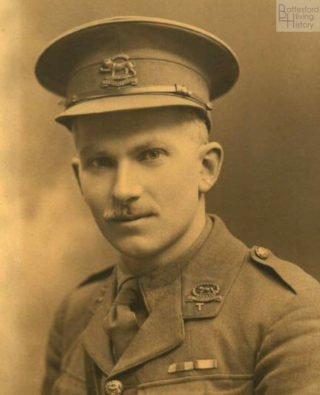 He was awarded the Military Cross in the 1918 New Year’s Honours “for an act or acts of exemplary gallantry during active operations against the enemy”, and could carry the MC and the three war medals, one wound stripe and four blue service chevrons. In August 1918, he returned to Britain to become an instructor with B-Company, Officer Cadet Battalion, Newmarket, and so was in England when the Armistice came in November, 1918. He was demobilized in 1919. Francis John Nugee was recorded in the Absentee Voters list for Leicester South, 1918, his address at St Martins South, the vicarage where his parents lived when his father was a Canon of the Cathedral. However, electoral registers between 1919 and 1928 all record him back at Radley College, where he had returned as an assistant master when he was demobilised. He was to remain there many years, becoming a Housemaster and then Sub Warden. He married Lucy Morris at Shangton in 1930. She had contracted polio, and was confined to a wheel-chair. They had two daughters, Lucy (Julian Walker’s mother), born on the 17th September, 1932, and Patricia. 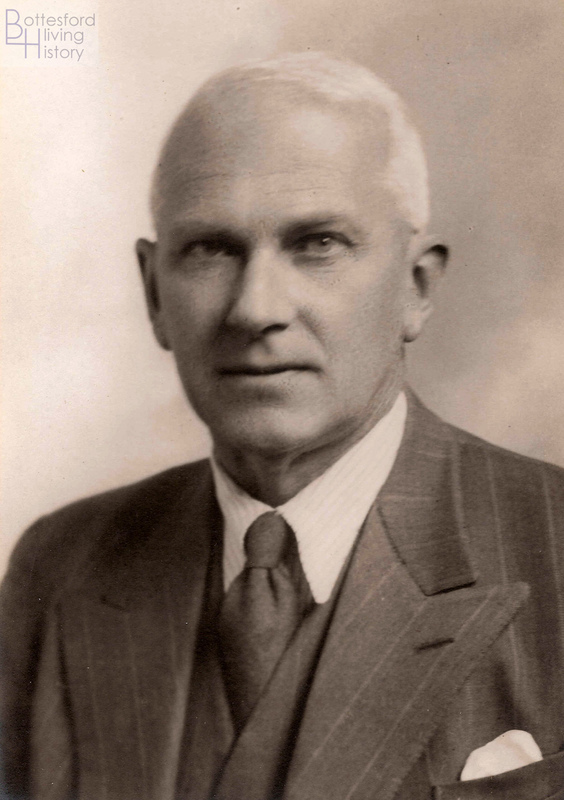 He left Radley in 1936 to become headmaster of Eastbourne College. The national Register of 1939 records his address at Eastbourne as: Headmaster’s House, Old Wish Road, Eastbourne. During the Second World War, he took charge of the evacuation of Eastbourne College to Radley. There had been a record entry of new boys, but many of them withdrew and numbers fell till they were below 150. 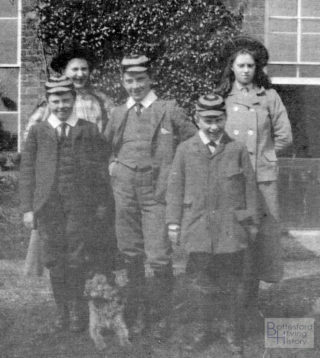 John returned to Eastbourne in 1946 with his family, and set about rebuilding the fortunes of the college, which was soon restored in numbers and reputation to what it had been before the war. John Nugee retired in 1956 and went to live in Cheltenham. About this time, he fell ill, suffering great pain in his back which was eventually diagnosed as an inoperable malignant growth. At first, it did not appear likely that he would live long, but certain drugs were prescribed in the hope that secondary growths would disappear. His illness never completely went away, but he lived until the 22nd January, 1966, when he died at Cheltenham aged 77. MC, 1914-15 Star, British War Medal, Victory Medal, one wound stripe and four blue service chevrons.